Designed for a multitude of uses from effective cleaning of pet hair to tough dirt on various types of surfaces, the Dyson DC44 Animal MK2 (mark 2) handheld vacuum seemingly does it all. It has powerful suction enhanced by its motorized attachments and holds several other advantages over the conventional handheld vacuum. Along with all its features and its abilities to do effective and varied cleaning tasks, comes a steep price to pay. Though for many users, especially those who have more than one cat, dog or both, the benefits justify and in some cases, outweigh the price point. No Loss Of Suction: Dyson implements their patented Root Cyclone technology which spins dust and dirt out of the air and into the bin, without clogging and as a result, suction power remains consistent. Powerful Suction: The combination of Dyson’s Root Cyclone technology and the digital motor, which spins up to three times faster than conventional motors, the DC44 Animal becomes the most powerful cordless handheld vacuum. Two Power Options: The Dual Power Mode feature provides either 20 minutes or high and constant suction for longer jobs, while the Boost mode gives you 8 minutes for tougher cleaning tasks. Ability To Clean Tough Dirt & Pet Hair From Different Surfaces: Included are different types of attachments for various purposes. The Motorized floor tool with carbon fiber filaments and stiff nylon bristles help to remove fine dust from hard surfaces as well as ground-in dirt from carpets. The Mini Motorized tool removes pet hair and dirt from upholstery and tight spaces. Long Reach: The handheld vacuum on its own doesn’t have a long reach. Fortunately, an aluminium long-wand attachment is provided which allows you to reach into narrow gaps and from the floor to the ceiling. Easy & Convenient Storage: Included is also a docking station which is attached to the wall, so anytime the vacuum is not in use, you can just dock it and it will be charged at the same time. The Dyson DC44 Animal is a complex product, and the people that know best about it are those who have actually purchased and tested it out over a period of time. We have researched over 70 positive and negative user reviews on Amazon to provide you with a general consensus of their experiences with the Dyson DC44. The lightweight body and easy maneuverability sits well among users. It’s able to get in and around corners, edges and confined spaces effortlessly. Essentially, it’s the variety of attachments that makes the DC44 Animal so versatile. Many users have stated their displeasure at the size of the dirt container. Capacity is only at 0.35 litres (0.09 gallons), making it too small for a device that cleans so effectively. For users with several pets, this means regular trips to the bin. 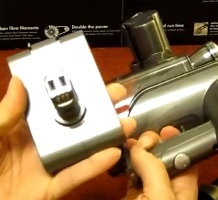 The power trigger needs to be held down to power the vacuum, and when released, the power turns off. This feature is not an issue with some users, as they understand that the vacuum is intended for short bursts of effective cleaning, while other users see it as more of a hassle especially for longer cleaning times. 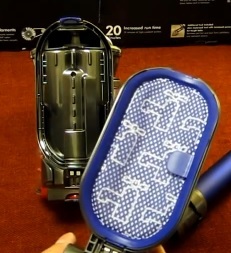 If you own other Dyson handhelds, the attachments that come with them will likely fit the DC44 as well, except for the motorized tools as they’re specialized to work only with their own particular model. 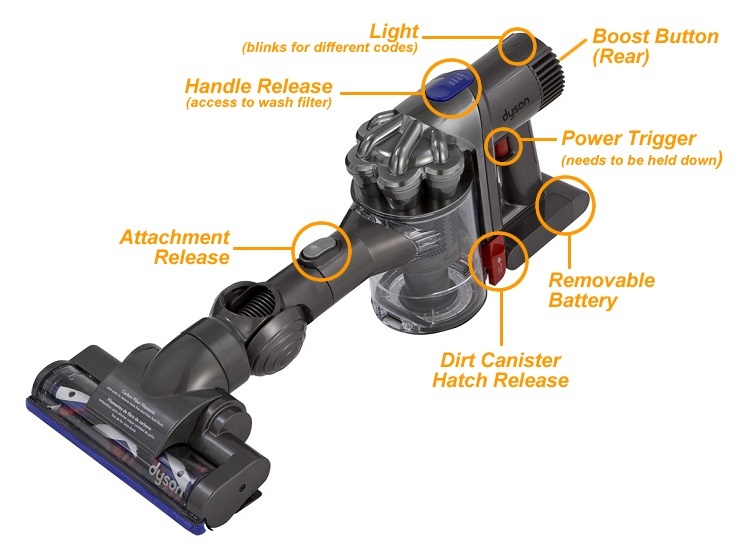 Dyson also has available a multitude of extra accessories and attachments that fit their handheld vacuums, and although they’re very useful, many users consider them to be too expensive (not much of a surprise though). This is considered to be the main head attachment and it combines nylon bristles to remove ground-in dirt from carpets and anti-static carbon fiber filaments to clean hard floors (which it won’t cause damage to). To steer around easier, it has a v-ball connection, which some users have pointed out is the reason that it’s much easier to use this large floor tool when it’s attached to the wand. The brush does very well to pick up hair especially on power boost mode, but a common issue experienced among users is that hair gets stuck in between the brushes (this problem is not exclusive to the Dyson DC44 as it happens to a lot of vacuums). When this happens, the brush continues to spin (it may stop if larger objects such as paper or rubber bands) and picks up more hair. To clean the brush, you must unlock the cover at the side of the brush with a coin, and the brushroll slides out. Users have advised to clean this regularly to ensure that it always runs smoothly. This is basically a smaller version of the large floor tool, except that it doesn’t use ball maneuverability, which makes it easier to use without attaching it to the wand. Many users have praised the mini floor tool for its ability to get around confined areas such as around chair legs, underneath sofas and inside closets. For picking up hair from carpets, rugs and upholstery, it’s just as effective as the large floor tool which also means that it needs to be regularly cleaned also. 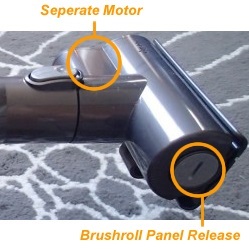 The brushroll slides out the same way, by using a coin to unlock the side panel. You must not expect it to pick up large objects with the large or mini floor tool since they will just end up bouncing around inside, get stuck or spit it back out. Made from lightweight aluminum, the long-reach wand is sturdy and provides extra length to the standalone handheld. It can be attached or detached from the handheld, but cannot be extended or shortened. The head attachments all can be attached to the end of the wand for cleaning different types of surfaces. A user also pointed out that the wand also fits other Dyson handhelds, so it may come of use if you have another model. For most users, the long-reach wand tool is essential because it helps them to reach high up to clean the ceiling, above the curtains, around doors etc. But it has found the most use on the ground, where it’s used exactly like an upright vacuum, and adds more focus and stability to the motorized brushes (as opposed to using them with the handheld alone). The long-reach wand makes life easier for users who have back problems or would just rather use their handheld as an upright vacuum. Both these handy tools can be attached at the end of the wand or used with the standalone handheld vacuum. The crevice tool is noticeably longer than the majority of other crevice tools, adding extra reach to the vacuum. It’s the combination brush that stands out for users, since it has been proven to be effective at cleaning blinds, baseboards and delicate surfaces. The main brush can actually slide back to reveal a harder nozzle brush. To make cleaning chores a lot easier, included is a wall bracket which holds the vacuum and is also able to hold the crevice tool and combination brush. Unfortunately, there is no holder for the other two head attachments, but most users don’t really see this as an issue. Instead, they find the convenience of being able to dock the vacuum and take it off for a quick clean a great benefit. Please bear in mind that the wall bracket can also be used as a charging dock, but the vacuum can be charged even if it’s not placed on the docking station. It appears to be a majority agreement that the Dyson DC44 animal greatly outperforms its competitors in terms of performance. Given the price tag, it’s not acceptable if it doesn’t. In standard mode, the suction power is moderately strong at 28 air watts but in Boost Mode, the power increases by just over double at 65 air watts. It’s able to pick up various sized dirt and debris although it’s not recommended to clean large debris (the size of m&m’s or skittles) using the motorized floor tools since they do not have entry points for them. Attaching the motorized floor tools largely enhances its cleaning effectiveness and is a major reason why the DC44 Animal is considered to be such a great cleaning device. Most users have no complaints about the level of noise, and some have compared it to the sound of a hair dryer. However, in Boost Mode, it does get noticeably louder. 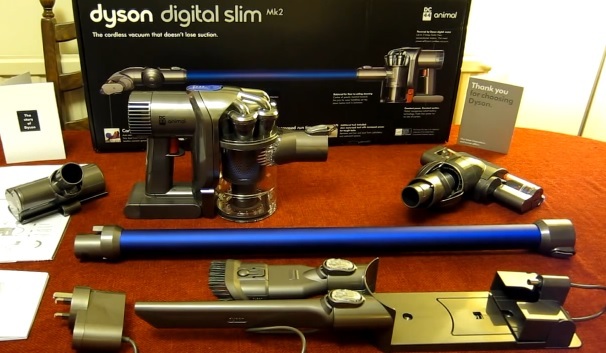 The Dyson DC44 Animal MK2 uses a 22.2 Volt Lithium Ion battery (can be removed and replaced), and Li-Ion batteries have already proven to last for many years with no memory effects. Dyson describes the running time as 20 minutes in standard mode and 8 minutes in boost mode. Since the device is powered by an on/off trigger, some users have experienced apparently longer running times than those stated. However, constant use with the motorized brushes takes up more power, therefore decreasing the running time. To fully charge the device, Dyson states that it must be charged for around 5.5 hours from empty, though some users have seen their device reach full charge within 3-4 hours from near empty. Once the device reaches full charge, it turns off automatically which saves energy and doesn’t hinder the battery as a result. Combine a very effective vacuum and a small dirt container and you get a device that requires high maintenance. Firstly, both motorized brushes should be cleaned regularly as they pick up hair very easily. 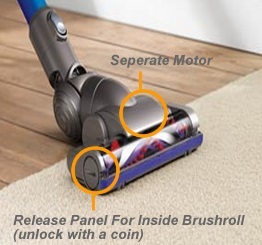 The side panel can be removed with a coin for the brushroll to slide out. Also, there is a wash filter (recommended to clean once a month) between the main base and the handle, and is released by pressing the button at the top of the unit. These are easy enough to clean and replace. With the dirt container however, some users have found it difficult to empty cleanly regardless of how much pounding and shaking is done. It cannot be completely removed from the base. And since the capacity is so little, users who do not empty it before it gets full, find that hair gets stuck at the top of the container. A pick object such as a pair of tweezers may be needed to root around it. It has also been mentioned that it helps to occasionally clean all the holes within the container with a toothbrush. The major problem critics have with the Dyson DC44 Animal is its very expensive price. Even users that love the device admit that it’s a bit too pricey, but are willing to pay up because it does so much more than ordinary handheld vacuums. One user gave a great analogy about Dyson vacuums being a Mercedes while lesser (but still good) vacuums were utilitarian cars. Ultimately, they’re both still cars and do the same thing, one just looks and does things a bit better. Another user stated that the DC44 Animal is like the combination of a regular but still decent upright and handheld vacuum. Granted, buying those together would still be cheaper than and do the same cleaning job, but it would just be a lot more hassle and take twice as long. It appears as though users are paying for the result of a mass advertised, thoroughly researched and development of a product, with the added benefit of convenience. There is of course, always the option for a refurbished model for over $100 less. The DC44 Animal is a highly rated handheld vacuum from Dyson with majority positive reviews on Amazon. We highly recommend you to watch the short clip below to get an insight into how and why the Dyson DC44 was produced. It’s excellent for you if you have more than one cat or dog as this handheld vacuum will do an effective job of cleaning up pet hair. Dirt container is tiny for a device that can clean so much, and it’s also difficult to empty and clean. Able to frequently clean a variety of different surfaces with the variety of high-quality attachments. The long-reach wand essentially turns a handheld into an upright, giving convenience to those who have back problems. Overall, there’s no argument that the Dyson DC44 Animal MK2 is a powerful and long-lasting cleaning device that outperforms the rest of its competition. However, for some users, it does more than they really need it for. In those cases, it’s probably better off going for a more basic and cheaper handheld vacuum. It’s not intended to replace a full powered upright vacuum that’s designed for long cleaning jobs on many carpets. So for something that’s meant as a supplement to an upright vacuum, the price is too steep. However, if you have deeper pockets or don’t mind paying for the best, then there currently is no other handheld vacuum that can match the Dyson DC44 Animal MK2 for its technology, power, flexibility and ultimately convenience. Check The Latest Price On The Dyson DC44 Animal Now!